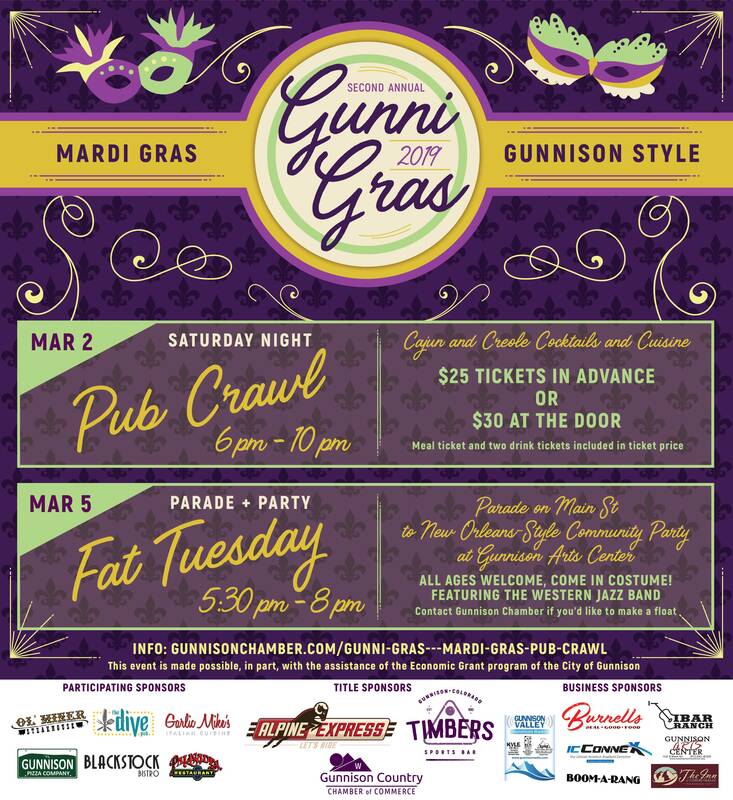 ​Fantastic way to celebrate Mardi Gras - Gunnison style. Enter to be in the parade or come cheer from the sidelines. Parade will start on North Main Street & Ohio and work its way to the finish at the Gunnison Arts Center. A New Orleans inspired family friendly party will take place at the Gunnison Arts Center with food and beverages to purchase. The Western Colorado University Jazz Band headed by Dr. Barrett will entertain with great jazz music. Big family community fun! Bring everyone - Come in Costumes! Let's celebrate mid-winter fun times -- Let the Good Times Roll. · Chamber will assign participant location prior to parade start. · Entries will stay out in front of the Arts Center until 7:30 pm. · All participants will need to have your entry cleared by 8:00 pm. Let the Good Times Roll! BE CREATIVE! Show off your best Mardi Gras float and Krewe! Light up your float! Must have own generator or power source.